Visits to msnbc.com are now being greeted with a choice. Clicking the latter link is a bit of a disappointment — all it offers is an email signup form. However, the background has a ghosted out version of what is presumably a look at the new site, which appears to offer “Explore,” “Watch,” “Just In” and “Speak Out” sections along with a large featured content aream, all set against a cleaner look. 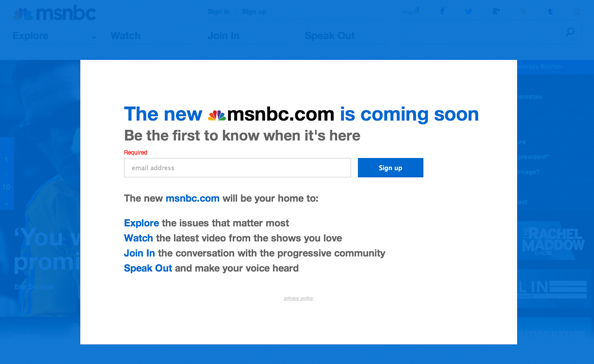 Back in July, msnbc.com visitors began getting a heads up that the news content ounce found on the domain was being relocated to nbcnews.com. Later in July, NewscastStudio spotted a redesigned story page on the NBC News site, which is slated for a redesigned later this fall. Those pages are still live. Meanwhile, CNN is prepping for its own website overhaul this fall as well and, although nothing has been officially announced, NewscastStudio also spotted some redesigned pages on FoxNews.com this summer.